Seattle Police hackathon worked on redacting body cam video streams. 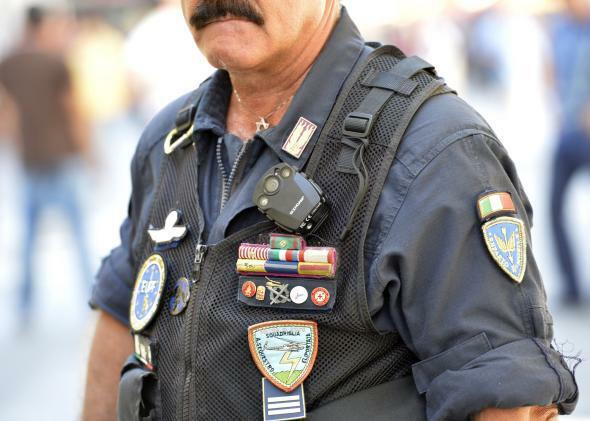 An Italian policeman wears a body cam in June. Along with police departments in New York City and Los Angeles, Seattle police are preparing to test body cams on officers in the field. In an attempt to find a balance between releasing footage and redacting private details, Seattle police held a hackathon of Friday. Discussion around whether law enforcement agents should wear body cams has surged in the months since the shooting of Michael Brown. And as funding comes through for pilot programs, it’s increasingly important to answer question about how these devices will be implemented. As GeekWire reports, about 80 people—including developers, community members, and law enforcement agents—attended the Seattle Police hackathon. The goal was to work on techniques for redacting things captured in streamed dashboard or body cam video such as people’s faces or license plate numbers. The hackathon was specifically looking to address these topics as they relate to Washington’s privacy laws, but the work could be relevant all over the country. Seven groups presented redaction tools, each with a different balance of automation and human review. The challenge is quickly processing large amounts of footage so the videos can become part of the public record without violating privacy. Many videos need no redaction if they are filmed in public spaces, but some groups, such as minors and people on private property, are afforded protections that must be reflected in the footage. Redaction of faces and facial blurring was a popular topic, with presenters from a group of University of Washington students as well as Simon Winder from the robotics and machine learning company Impressive Machines.